Among the challenges facing community practitioners are trends to privatization and overdependence on the market economy to solve pressing problems. Opportunities for impactful practice may then instead lie in the sharing economy. In such an economy, goods and services are loaned, shared, cooperatively owned, or exchanged. One example of the sharing economy is the free store, a place where goods are exchanged without money changing hands. This Bulletin shares a brief story of a free store on a college campus, to demonstrate the sharing economy’s positive aspects. While this free store was campus-based, the same concepts can be adapted to communities outside campus walls. The story goes that free stores began in the 1960’s with the Diggers, a counter culture group dedicated to freeing oneself of property and living outside capitalist markets (see more at http://www.diggers.org/overview.htm). Free stores look like any other thrift store with gently used clothing, household goods, furniture, electronics, etc; however, as the name indicates, everything is free and doesn’t require reciprocity. Beyond free stores there are now many stories of the free exchange of goods such as neighborhood free markets, online swaps, neighborhood exchange boxes, and exchanges based on specific goods such as seed exchanges (see shareable.net for more). It seems that this increase in the utilization of the sharing economy has been a result of the environmental movement and the downturn in the economy (Albinsson & Perera, 2012). Free stores function within the confines of all three pillars of sustainability including environmental, economic, and social. Free stores provide an opportunity to recover some of the tens of millions of tons of furniture, furnishings, clothing, and footwear generated every year (EPA, 2013). They also provide an avenue to address economic needs through the provision of goods such as clothing and household items. Finally, being careful not to overstate their impact, free stores can contribute to sustainable communities by building connections, facilitating neighborliness, and providing a place and excuse for interaction much in the same way that garage sales have done (Herrmann, 2006). Research on free temporary markets has found themes of community building, creation of interactions, sharing of skills, and caring for others during the events (Albinsson & Perera, 2012). Most of all, free stores have the potential to foster inclusion in a community. Anyone can participate. If set up properly, a free store can be for everyone and used by everyone with no stigma attached. They don’t have to be attached to the idea of welfare, social services, or poverty alleviation. It can simply be about reuse. They foster inclusion because they are focused on the well-being of all instead of a few (Albinsson & Perera, 2012). A few years ago, while working for a private women’s college, I had the opportunity to be involved in the development and management of a free store on campus. It was begun by a creative and pioneering sustainability coordinator along with the support of the events office, residence life, the volunteer office, and several faculty members. The free store, located within an empty residence hall room, was designed as a boutique by an interior design course. Beginning from a few of us climbing through dumpsters to save reusable items from the landfill, it morphed into a fully supported program with permanent space, a budget, and a student worker manager who maintained inventory and coordinated marketing and engagement efforts. The store looked very much like any small clothing boutique including a dressing room. Any student was welcome to come through and take from the plethora of household and clothing items. Donations were more than welcomed but not necessary in order to “shop.” Goods were obtained during the residence hall move-out process. 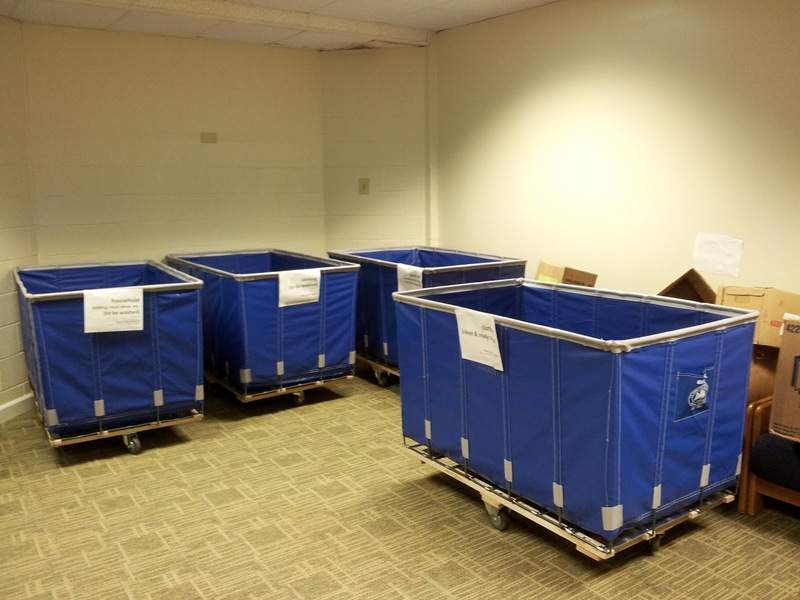 Goodwill provided large rolling laundry carts that were placed in each of the residence halls a few weeks before spring graduation and students were encouraged to donate items they didn’t want to take home. Goods were then processed and sorted for the free store, Goodwill, and a local creative reuse center. At the end of move-out, our collective efforts typically produced anywhere between 10 and 14 large laundry carts worth of goods, valued by Goodwill at $2000 per cart. The sheer number of shower caddies alone saved from the dumpster could have filled anyone’s bedroom closet. The free store was a demonstration of the partnership possibilities within a campus environment. Residence Life provided the space and assisted in facilitating the collection of items during move-out. It was incorporated into orientation and move-in day activities to provide goods to help resident students set up their new residence hall rooms. It was also included into alumnae reunions and provided a donation venue for alums. It provided a venue for volunteer opportunities to engage students, and faculty were able to connect to the store through service-learning hours and projects. Eventually, new initiatives grew out of the free store, such as an interview clothing exchange and a campus food pantry and has recently been connected to a new scholarship program as a volunteer site. While the free store experienced many challenges and its fair share of growing pains, it was able to achieve positive outcomes that could be replicated on other campuses and in the community. It provided a common goal to galvanize partnerships across campus, provided goods to fulfill student needs, served as a volunteer opportunity for students, and saved tens of thousands of dollars of goods from the landfill. More importantly, it was an avenue to teach and engage students. Informally, we witnessed a shift in consciousness of the students, demonstrating a sense of pride for the boutique and implementing reuse principles into their events. Overall, it provided an impetus to have a conversation about reuse and engagement and work together in a collaborative partnership to make an impact in the life of the campus. The positive outcomes from this example can also be seen in the various free stores and similar reuse initiatives on other college campuses that have been established both before and since our store (see www.shareable.net and aashe.org). As a community practitioner, to me the most important outcome was the inclusive nature of the store. The original purpose was reuse and saving useable items from the landfill. It was not created with the intent of addressing emergency needs of students, although it inadvertently served that purpose. All students could frequent the store without stigma or feeling that they had to hide their patronage. It also allowed us to give the students a volunteer experience outside the realm of traditional servanthood and didn’t have the consequence of setting up an “us and them” scenario or a “savior” orientation. Because it was incorporated into many aspects of the campus, it became a common cause that students could support and rally around. It was a demonstration of inclusion through equality, which is what we would hope to achieve in any community practice. In my experience with the sharing economy as outlined here, I’ve seen that this realm of life has the potential for community practice. Ultimately, a free store allows us to both utilize and undermine the American consumer culture while making friends, sharing goods, and saving the planet one shower caddy at a time. The Diggers would be proud. Albinsson, P. A., & Yasanthi Perera, B. (2012). Alternative marketplaces in the 21st century: Building community through sharing events. Journal of consumer Behaviour, 11(4), 303-315. Environmental Protection Agency. (June 2015). Advancing sustainable materials management: Facts and figures 2013. Retrieved from http://www.epa.gov/wastes/nonhaz/municipal/msw99.htm. Herrmann, G. M. (2006). Garage sales make good neighbors: Building community through neighborhood sales. Human organization, 65(2), 181-191.